A Long March 2D rocket took to the skies on Saturday, March 17, sending China’s Land Surveying Satellite-4 into orbit. The booster blasted off at 7:10 GMT (2:10 a.m. EST) from the Jiuquan Satellite Launch Center (JSLC) in China’s Gansu Province. Given that the task of the mission was to deliver the satellite into a low-Earth orbit (LEO), the flight most likely lasted about 10 minutes. The exact timeline of the mission remains undisclosed as China usually does not reveal any details about its orbital launches and pre-launch preparations as well. Sticking to the nominal flight profile, the Long March 2D’s first stage powered the mission for the first three minutes of the mission. During this phase of the flight, the rocket started heading South, over mainland China and toward the South China Sea. When the core stage separated from the launch vehicle, at approximately T+3 minutes, the second stage took control over the mission, igniting its YF-24C cluster engine. The second stage, tasked with deploying the spacecraft into designated orbit, finished its job some 10 minutes after liftoff. The satellite was then successfully inserted into LEO, however, details regarding its orbital spot remain unknown to the public. Land Surveying Satellite-4 (also known as LKW-4, Ludikancha Weixing-4 or Yaogan Weixing-34) was built by the China Academy of Space Technology (CAST). Experts suppose that it is an electro-optical observation satellite based on the military Jianbing-6 series. The spacecraft most likely utilizes uses the CAST-2000 bus, which has a dry mass of about one metric ton. The first Yaogan satellite was launched in 2006, whereas the second generation of the series was inaugurated in 2008. LKW-4’s predecessors, designated LKW-1, LKW-2 and LKW-3 were orbited by China on December 3, 2017, December 23, 2017, and January 13, 2018 respectively. All the four LKW spacecraft will probably operate from an altitude of about 310 miles (500 kilometers). As was the case with previous three LKW satellites, China claims that LKW-4 will be used for civilian purposes. The state-run Xinhua press agency insists that it is a land-exploration satellite and therefore it will be mainly used for remote sensing exploration of land resources. However, Western analysts believe that LKW-4 is a military surveillance spacecraft. The two-stage Long March 2D rocket was developed by the Shanghai Academy of Spaceflight Technology. It is mainly used to launch a variety of satellites into LEO. The 135-foot (41.15-meter) tall booster can launch payloads of up to 3.9 tons (3.5 metric tons) to LEO and has a Sun-synchronous orbit (SSO) capability of up to 1.4 tons (1.3 metric tons). Long March 2D was launched for the first time on August 9, 1992, from the Jiuquan Satellite Launch Center. 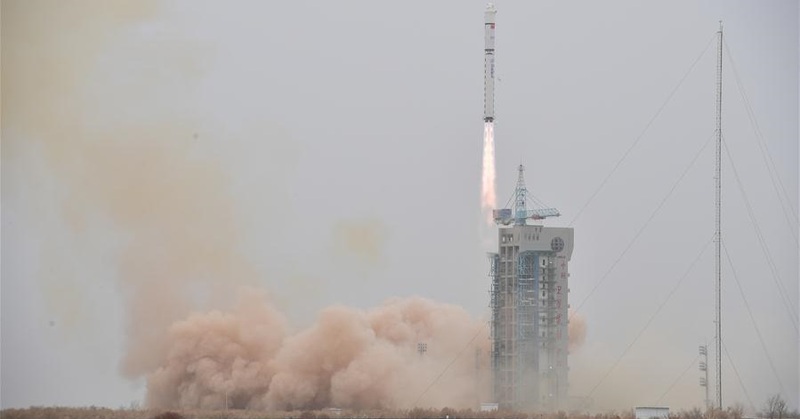 It orbited the Fanhui Shei Weixing FSW-2-1 recoverable satellite. Saturday’s launch was the 268th flight of the Long March rocket series. The next Chinese mission is currently scheduled to take place on March 26, when a Long March 3B booster will send a duo of BeiDou-3 satellites into space. However, some other mission could be launched sooner as Beijing conducts many of its orbital flights unannounced.